A parliamentary report of 1777 listed parish workhouses operating at Hailsham (with accommodation for up to 40 inmates), Chiddingly (25), Herstmonceux (45), Heathfield (40), Hooe (30), Ninfield (15), Warbleton (60) and Wartling (40). Parish workhouses also existed at Hellingly and Laughton. Chiddingly's workhouse was at Nash Street, Golden Cross. It is now a private house. Hooe's workhouse was at the north-east of Hooe Common. The site is shown on the 1873 map below. Hooe parish workhouse site, 1873. 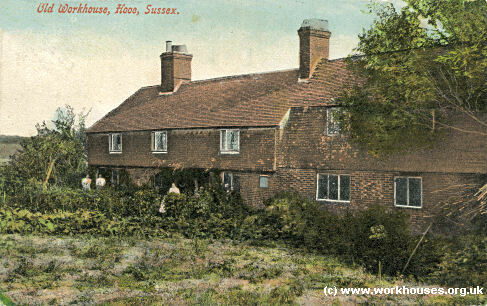 Hooe former parish workhouse, c.1910. 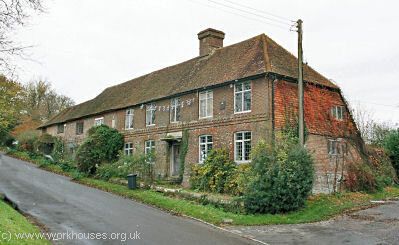 The Warbleton parish workhouse, located in the centre of the village, later became a school. Warbleton former parish workhouse, 2004. 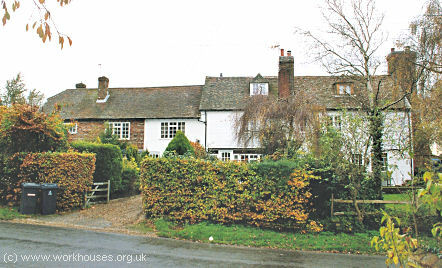 Laughton's parish workhouse, now converted to three cottages, was situated on Church Road. Laughton former parish workhouse, 2004. County of Sussex: Arlington, Chiddingly, Hailsham (2), Heathfield (2), Hellingley [Hellingly] (2), Herstmonceux (2), Hooe, Laughton, Ninfield, Warbleton (2), Wartling. Later Additions: Chalvington (from 1898), Ripe (from 1898). The population falling within the Union at the 1831 census had been 11,825 with parishes ranging in size from Hooe (population 525) to Heathfield (1,801) and Hailsham itself (1,445). The average annual poor-rate expenditure for the period 1831-34 had been £18,351 or £1.11s.0d. per head of the population. 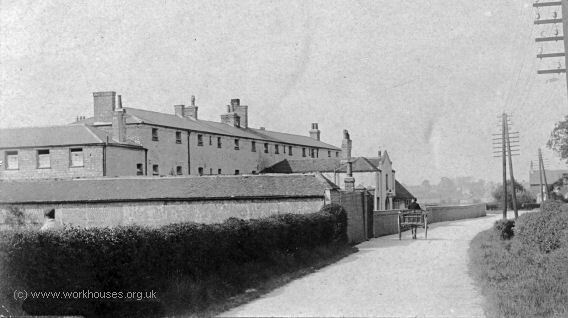 Hailsham workhouse from the south, c.1908. After 1930, the workhouse briefly operated as a Public Assistance Institution but was closed in 1932 and subsequently demolished. Housing now occupies the site. East Sussex Record Office, The Keep, Woollards Way, Brighton, BN1 9BP. Holdings include Guardians' minutes (1836-1930); Births register (1836-1930); Deaths register (1836-1930); Admissions and discharges (1835-1930); etc.